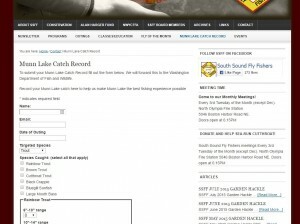 The Munn Lake Catch Record Form has gotten a face lift! The new form should be a bit easier to use with its drop down menus to select # of fish caught. There are new sections added for cutthroat trout and warmwater species. Also a place to add # of anglers on the lake. WDFW really appreciates the feedback, so keep them coming!